The HYDRIM L-100W and G4 Dental Washers consistently deliver the highest quality fully automated washing. Pre-programmed Cycles (P1- Rinse and Hold, P2 Regular, and P3 Heavy Duty) deliver accurate times and temperatures. HYDRIM Washers clean faster, cut cleaning costs, and deliver residue free surgical instruments and utensils. The HYDRIM G4 Washers deliver the same washing excellence provided by the HYDRIM L-100w Washers with the added features of on-line and USB Port for service-diagnostics-support and cycle data storage. HYDRIM Surgical Instrument Washers for washing dental surgical instrument, washer specifications, go to HYDRIM Surgical Instrument Washers. Dental Surgical Instrument Washer Disinfectors cut costs. 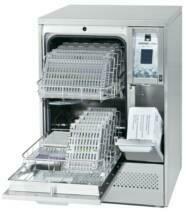 Dental Surgical Instrument Washer Disinfectors save space. Dental Surgical Instrument Washer Disinfectors improve turnaround. HYDRIM L110w Dental Surgical Instrument Washers can process 2,500 instruments per day. The dental handpieces are securely contained within 9 or 21 handpiece holders.